Do you know about our state? If you grew up in North Carolina, you learned all about it in 4th grade. I loved learning about our state and everything in it. I look fondly on remembering things like our state mammal (gray squirrel), state gem (emerald), state tree (longleaf pine--even though the loblolly is my favorite). If you didn't know all of those things, now you do. Now, let me tell you a little more about Our State. Our State magazine has an 80 year-old tradition of highlighting, celebrating and documenting everything about the Old North State. People, food, places, traditions, triumphs, tragedies and everything in between has been photographed and written about in this specialty periodical. Our State is a monthly publication and the April 2013 is on newsstands now. Details about the giveaway I promised are at the bottom of this post, just so you don't think I forgot. I was invited to an Our State April Issue preview party this week at Crook's Corner restaurant in Chapel Hill. I got the fortunate opportunity to meet Chef Bill Smith of Crook's Corner, the award-winning, acclaimed cookbook writing, all around good guy. He was unassuming, yet inviting. Only his carefully affixed paper nametag gave him away. I introduced myself to him with a deviled egg in one hand and a napkin in the other. He and his staff filled us with miniature Coca-Cola braised ham biscuits, pimiento cheese, curry-pasted cheese crackers shaped like pigs, brownstone cake, pine nut-filled kibbe, rice beignets, and two kinds of deviled eggs. My first time at the restaurant will not be my last, as I look forward to trying the fried oysters (a nod to the location's humble beginnings) and the signature cheese pork dish. Halve the eggs lengthwise and remove the yolks to a mixing bowl. If any white break, add them to the yolks. Mash the yolks with a fork, then stir in the vinegar, mustards, mayonnaise, salt and pepper. the filling will be dry, I prefer this, but if you don't, add a little more mayonnaise. Fold in the minced vegetables. Refill the white with this mixture. Dust with the paprika-chili powder blend. 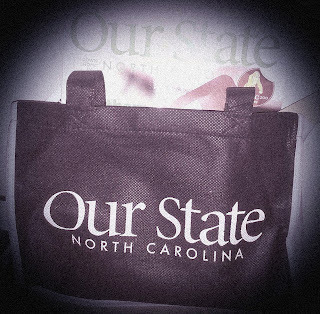 Starting today (3/22/13) through Thursday, March 28, you can WIN an Our State magazine swag bag filled with Southern hospitality--the April 2013 issue of Our State, TWO cookbooks and a few extra culinary goodies from Nik Snacks. To enter this giveaway, simply leave a comment below this post. For details on how to get additional entries (to increase your chances of winning), click here. This bag could be yours! This is not a sponsored post. All opinions in this post are my own. What a great giveaway. I love how Our State really shows the world how beautiful NC is! Thanks for the chance! What a great giveaway! I love Our State! Thanks for hosting this. I am a fan on Facebook and shared the giveaway. This is an awesome giveaway! Hope you are well Trikki! Love Our State Magazine & Nik Snacks! Love the bag too! Couldn't decide which one was more of a twist, the jalepenos or the apple cider vinegar. May need to try this one. I received an email yesterday from Mom telling me it was Easter lunch time and Deviled Eggs were my responsibility. Great timing! :) One of my favorite items to prepare. I wish we had an Our State Magazine!! but hey I'm o close to NC that I would love to get my hands on a copy. I spend more time traveling south through NC than I do north through VA. I'll have to check out that restaurant next time I'm down that way! ooo and why don't you have a deviled egg platter! 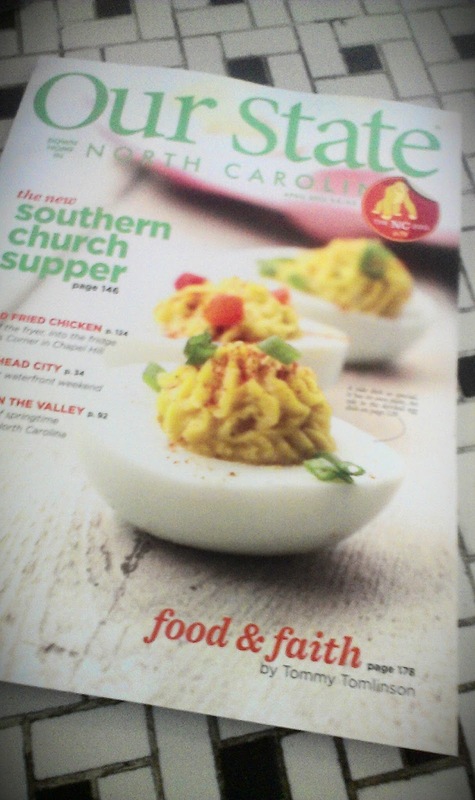 haha I thought getting a deviled egg platter was a right of passage for all southern women. Love this! Always looking for different twists on Deviled Eggs!